Deputy State's Attorney Janice Bledsoe and Chief Deputy State's Attorney Michael Schatzow answering questions about their investigation and courtroom strategy in the Freddie Gray case. Prosecutors defended Thursday their investigation and strategy in the case of Freddie Gray, who died from injuries suffered in police custody. Chief Deputy State’s Attorney Michael Schatzow said in a news conference they believed in the case and were prepared to continue with the trials. But State’s Attorney Marilyn Mosby determined that they had to be realistic. 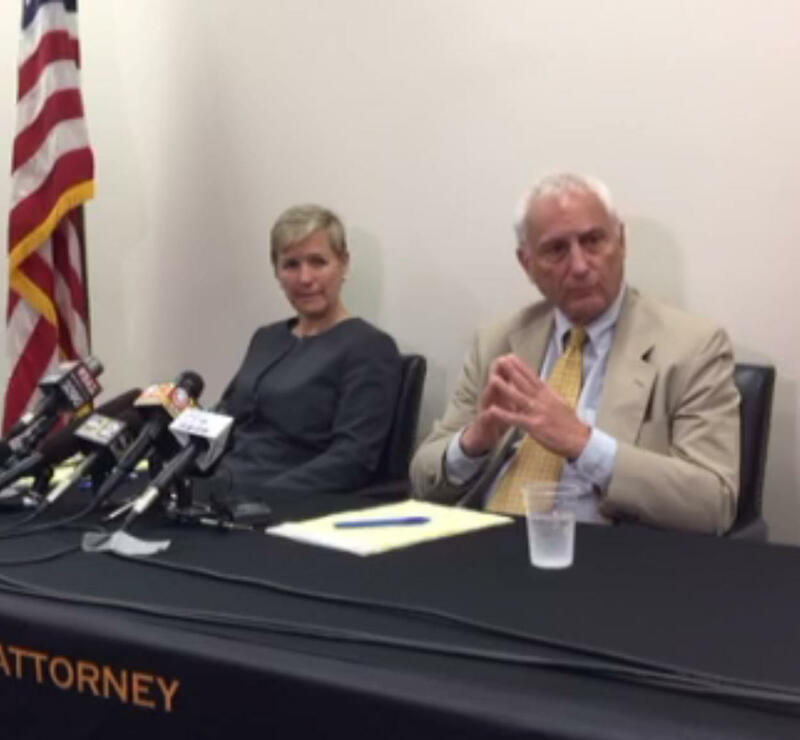 It was the first time Schatzow and Deputy State’s Attorney Janice Bledsoe have spoken publicly since trials ended and Baltimore Circuit Judge Barry Williams lifted a gag order he had imposed before the first trial started. Prosecutors dropped charges against three of the six accused officers – Officers Garrett Miller, William Porter and Sgt. Alicia White –Wednesday. Williams acquitted Officers Edward Nero, Caesar Goodson and Lt. Brian Rice after their trials. When Mosby announced charges against the six officers in May 2015, she claimed her office had conducted an independent investigation with the help of the city sheriff’s office. Bledsoe said their investigators were in Sandtown-Winchester shortly after Gray was hospitalized for the injuries incurred in the back of a police van in April 2015. Schatzow added neither he nor Bledsoe were rushed to indict the six officers and that they didn’t overlook anything. The prosecutors said they had difficulty gathering evidence. Bledsoe said they obtained search warrants for the officers’ personal cell phones. But city police did not execute the warrants before they expired. When Gray was arrested, he was placed in the van – handcuffed with his legs shackled – without being belted in. Prosecutors argued during the trial that Gray’s death from a broken neck occurred because none of the officers involved followed a police department policy requiring prisoners to wear seatbelts. Schatzow said the violation of a police policy, known as general orders, is relevant when determining whether someone broke the law. But Judge Williams ruled that a violation of a general order does not indicate criminal negligence. Schatzow said they were prepared for a jury trial, but three of the defendants – Nero, Goodson and Rice – elected bench trials. He insisted they adjusted for the bench trials. The only jury trial in the case – Porter – ended in a hung jury last December.